Have you seen the New York Times room for debate series looking at Motherhood vs. Feminism? If not, you should go take a look. There was no real debate, no discussion at all. They shared a handful of essays with varying viewpoints along a spectrum that somehow pitted motherhood on one side and feminism on the other… as if the two must be mutually exclusive. And that's a problem. In fact, it's a huge problem. It pits women against one another, oversimplifies the complexities of real life choices, and makes it harder for all parents to get the resources they need. But I still found the individual articles within the series to be worthwhile, even if I wish they weren't framed as some sort of battle royale fight-to-the-death. The series offers great insight from very smart people, including Annie from PhD in Parenting, a blog I love. Truly, there is something to be gained from all of these women's perspectives. I found a connection even with LaShaun Williams (whose contribution is titled "Good Riddance to Feminism!" so, as you can probably guess, I don't really agree with her overall premise). It seems to me that we are targeting the wrong culprit in this debate. Attachment parenting does not do anything to us, it does not “destroy feminism,” it is not “bad for working moms.” It is simply an ideology we can use within the context of our own life and priorities. Like any tool, it can be misused and wielded as a weapon of judgement. This kind of "weapon of judgment" is the thing that makes us so divisive, so quick to tear one another apart, so determined to stake out our territory and protect the boundaries. And I really like what Blois says about tools. Because, at the end of the day, isn't that what an ideology is? A tool to help us see the world in a way that makes sense to us? It reminds me of that discussion with the Ashley Judd piece. Some people took issue with Judd's identification as a feminist because, as an actress, she had benefited from her looks and the patriarchal definition of beauty. I was leery of this criticism because if we start drawing lines like that around the definition of feminism, there's not really going to be anyone left. If we start to see "feminism" (I'm singling out "feminism" here because that's the subject at hand, but this really applies to any system of beliefs that we take up) as an ideal to attain rather than a lens to use, it becomes impractical, a theory that might be nice to talk about, but not one we can readily apply to our real life. And I need to be able to apply it to my real life, because my real life is messy in ways those tools can address. I envision my identity as spheres that have to fit within my ideological frameworks. There are the roles that I play (personal and professional), and those fit into the belief systems that I have. I have lots of belief systems (religious, political, etc.) but these are the ones that seem most readily influential over these particular roles in my life. Human Equality- I am guided by a very strong belief that humans are inherently equal. They deserve equal access to opportunities and they have equal potential to contribute to the world. 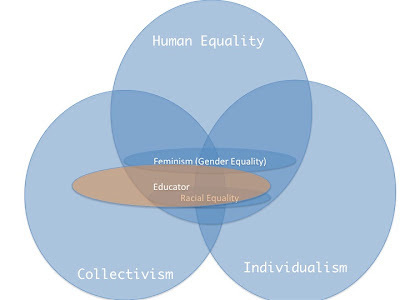 Within this belief system, I spend a lot of time thinking about Racial Equality and Feminism (Gender Equality). I recognize that there are lots and lots of other types of equality that fall under "Human Equality," but these are the two that I most readily see and think about, probably because these are the two that are most readily apparent in my own life. Individualism- While it may seem--on the surface--at odds with a strict adherence to the principle that all humans are equal, I am also a strong believer in individualism. I believe that people must seek their own paths and take responsibility for their futures. I believe that people have unique talents, abilities, and interests, and that those should guide their decisions. I believe that people's individuality is important and that different viewpoints are valuable. Collectivism- To further complicate this worldview, I also believe that there is a collective influence that we must operate within. While people may have individual goals and talents, I believe that their importance is largely determined by a collective knowledge. This is why media is so important to me; the ideas that we allow to stand for our cultural knowledge are often portrayed in our media, and this represents the way that we interact with the world collectively. So those are three of the main ideological systems that affect how I view the world. The important thing is that all of these systems are tools; they are tools that help me figure out how to make decisions. They are tools that help me figure out what I believe about myself and others. They are tools that help me figure out where to live, what to do for a career, etc. These tools have very real applications to my life. Every role that I have can be mapped out as influenced by these tools. My role as wife is largely influenced by my Individualism. I see my marriage as something important to me as an individual, something that fits into who I am and what I want out of my life as well as how I interact with my husband on a personal level. However, it is still influenced by the collective definition of what it means to be a wife. My understanding of feminism factors into my role as wife heavily, as it is very important to me that the collectivist idea of what it means to be "wife" doesn't impede upon my individual definition of what it means for me to be a wife. As a white woman married to a black man, racial equality also factors into my understanding of my role as wife, but since I will always have white privilege that my husband does not, I feel that my understanding of the way this particular realm of equality operates will always be tangential. I could likewise look at the way these ideologies have informed my understanding of my role as educator. I see education as a largely collectivist endeavor; after all, the goal of education is to share a collective pool of knowledge in a way that shapes students for participation in a larger society. Most of my work as an educator has centered around ensuring equal access to education for underrepresented populations, a position that has been heavily influenced by my understanding of racial equality. Individualism plays a role in my understanding of education because I recognize that both myself and my students are individuals. I have to take into account my individual skills as a teacher as well as my students' individual goals and learning styles. Which brings me to my role as mother, the focal point for this "debate." My motherhood is heavily influenced by my understanding of racial and gender equality, especially since I am the mother of a biracial daughter. It is also heavily influenced by my understanding of individualism, as it is important to me that my individual skills and interests are maintained during my role as mother, both through the act of mothering and through the way that I do other activities while simultaneously mothering (like working outside the home). There is a collectivist influence on what it means to be a mother, and that influence helps me by providing data (like medical research) that informs decisions as well as find common ground with other parents. These systems of ideologies help me figure out how to navigate my roles, and those ideologies aren't always applied consistently. For example, the decisions I made about equally shared parenting and the decisions I made about breastfeeding came from different perspectives. As a mother, I chose to equally share parenting responsibilities with my husband, and that was largely influenced by my understanding of feminism and gender equality. However, when I chose to breastfeed, I was influenced by different ideologies. Many of those factors came from the collectivist knowledge that breastfeeding had health benefits for my daughter. When I felt that breastfeeding was at odds with the principle of equally shared parenting, I used other ideological frames to look at it. Though I couldn't technically share this responsibility with my husband, I knew that it was helping me to individually form a bond with my daughter. My motherhood was not entirely bound by gender equality, even though that is a huge part of it. By recognizing that feminism was a useful lens and not a strict set of rules I had to follow, I was able to make a decision that worked best for me and my family. This is just one small example of how ideological systems can be used as complementary tools, not competing ones. If I used any one belief system to entirely inform any of my roles, those roles would be too rigid to succeed. Life is messy. Things change and answers are complicated. By having a set of lenses that I can shift, layer, and expand upon, I am able to meet the demands of several roles simultaneously. So the phrase "Feminism vs. Motherhood" has no meaning to me. Feminism is an ideology I use to view the world. Motherhood is a role that I ascribe to within that world. Feminism certainly informs my understanding of motherhood, but it doesn't define it, and it certainly doesn't negate it.